Ever wondered what it would be like to work at the head office of a company that creates the all-time favourite toy, LEGO? Looking into this, it looks like it would be a dream come true! The main office is based in Billund, Denmark, but over the generations the company has spread globally and they even have one in London! The interior of each office is designed with the product itself as the main focus. Designers Rosan Bosch and Rune Fjord were the key players in the design process and plenty of work and energy went into making sure that enough imagination and creativity can be found within the employee’s surroundings. Adaptable and colourful furniture is used all around the office. Much like the LEGO pieces themselves, making use of different seating configurations in breakout and meeting areas means the possibilities of seating and meeting arrangements are endless! The display shelves are set up around the designers in their creative offices. Having used plain colours for the shelves, the designers are able to show off their own creations clearly and inspire others. Displaying their work is also a reminder that the creations are more than just a few “bricks” and that even the slightest bit of imagination will allow you to build anything. LEGO… Such an inspirational tool! The interior design does not end there however… The designers who created these masterpiece office suites have even decorated the lighting! 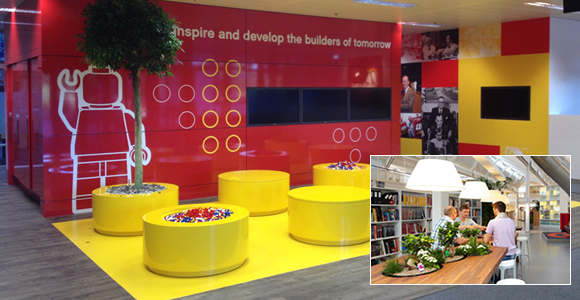 In the London office, they have used the recognisable LEGO brand colours, yellow and red. 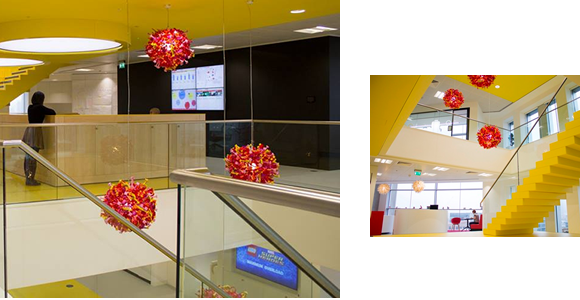 The yellow stair case is met with lights, shrouded with various LEGO pieces, that are predominantly red. The playful design is a fantastic feature and a great welcome for any guest as well as for anyone who works there. Creativity and fantasy immediately greet you on entry. The main reception is based around the idea of being “between two LEGO piece themselves”. The lighting and internal structure creates the illusion that you are actually between two yellow LEGO bricks. The use of lighting and seating emphasises the structure of both particular pieces. This is definitely a new take on the “fish bowl” concept, which is a popular interior design choice. Playing with perceptions and questioning our imagination within the office space shows us that the possibilities of the mind are no different to the creations that can be achieved with LEGO. The open plan office space allows for the team to be able to work together, with fantasy and imagination having free rein. The use of glass “opens up” wall space, expanding the free space that is available for the mind. Playful colours are used to engage brain activity and reflect the LEGO bricks that designers may be engaging with. It looks pretty too! Unfortunately the building is not built from LEGO pieces, the main structure is plaster and the colours used are themed around the industry’s products. 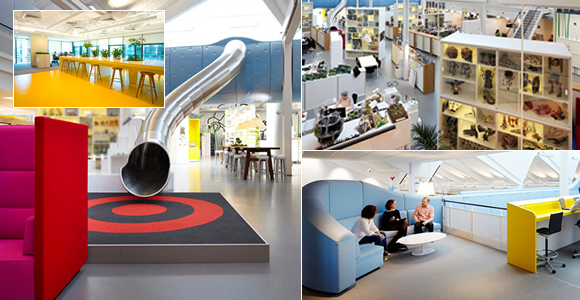 Denmark is no stranger to great design in architecture or interiors and LEGO HQ is no exception. I am now thinking that I would be just as excited about seeing the head office as I would going to Legoland in Windsor… And that is saying something!